Nearly half the world’s population, 2.8 billion people, survive on less than $2 a day. Quotes like this are shocking; but practically, I don't understand how a person could survive with food, water, clothing, etc. on such little income. Does half the world's population live on less than $2 a day? What does money mean to those people? Does money not really matter because most of their living is outside the realm of money (e.g. making their own things, food, etc.)? In my country you could easily get a meal for $10, or cooking yourself about $3 or $4 per person. In that case, does "$2 a day" mean anything? Or is it just there to shock people? Just to clarify, the quote (or similar) is often used for first-world countries to imagine living—as they are, where they are—on an income of $2 per day. My question is: Is this an accurate representation of the poverty of half the world? Or is it skewed, because the income is a fixed value, where costs of living and sources of food/goods can be so varied. That's why this question is on Skeptics, not other SE sites. The 'keyword' to look for is 'PPP' for Purchasing Power Parity. This is a way of translating incomes across the world into a common (generally dollar) currency taking into account the difference in prices (and inflation too, if comparing back in time). The official World Bank figure for "absolute poverty" is $1.90 a day, per person. On the linked page, they were predicting that 700 million people would be 'absolutely poor' in 2015. This is no where near the 'Half the world' figure on the page you linked to, so I guess maybe the UN are using absolute dollar figures. To answer your last question: it is both true and shocking, and even more shocking when you take into account PPP. This means that 700 million people are having to get by on the equivalent of $1.90 a day, and as you say, that doesn't get you far at all. All is not doom-and-gloom though, things are really getting better all the time. in 2015, there were 702 m people living on less than $1.90 per day (at 2011 prices). Myth #1: "stuff is much cheaper in poorer countries; therefore $$1.90 can go a longer way in poorer countries." This is wrong. When such figures as "702 million people survive on less than $1.90 per day" are quoted, they really DO mean that the world's most miserable 702 m people have to survive as if they had less than $1.90 a day, while facing the average USA prices! 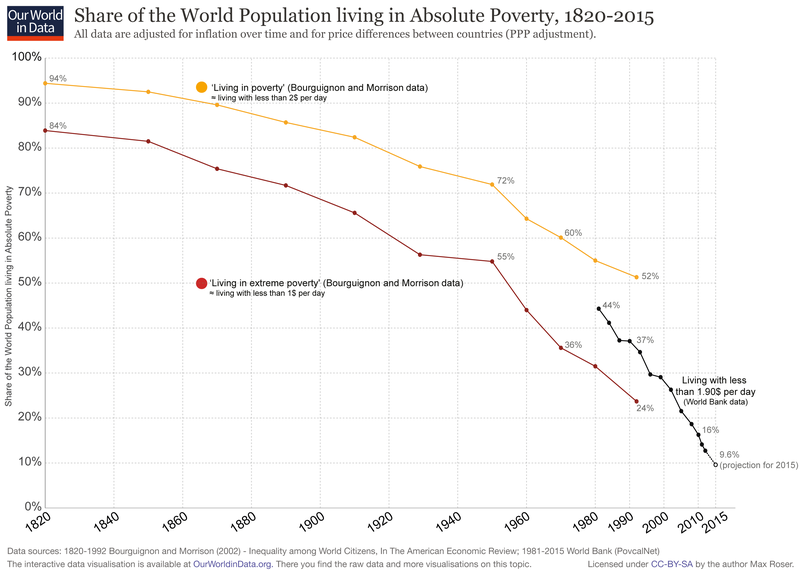 This is shocking and unbelievable for those from countries with no historical experience of extreme poverty (e.g. the US). But it is sadly true. How do these 702 m people survive on less than $1.90 per day at USA prices? Well, many of them don't. And those who do, manage to survive, only very barely and very miserably. "... For example, a farmer who owns a huge farm and lots of livestock, simply survives off his produce, never engages in any monetary transactions with anyone, will be counted by the World Bank as having an income of $0/day and therefore be counted as 'extremely poor'. But he may actually be extremely well-off and have all that he needs." This is also wrong. Unfortunately and again shockingly, the $1.90/day figure already accounts for all such non-monetary transactions and also all self-produced, self-consumed goods. So the farmer with the huge farm will also have a (correspondingly-huge) monetary value imputed to his annual agricultural produce, and he will NOT show up as having $0/year in the poverty count. Instead, he will show up as a reasonably affluent man. Bottom line: The $1.90/day figure is unbelievable for most people living in rich countries. But that's really what it means. Surviving on $1.90 per person per day, in a place where the prices of goods and services are the same as in Averagetown, USA. $1 (or $1.01) per day at 1985 prices. $1.08 per day at 1993 prices. $1.25 per day at 2005 prices. 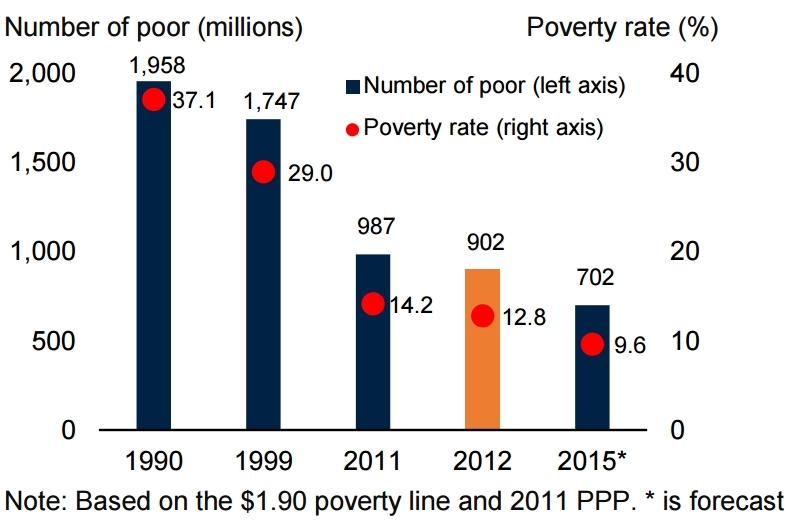 Note that at least conceptually, the extreme poverty threshold is supposed to have stayed the same in real terms. That is, $1.90 per day at 2011 prices is supposed to be equivalent to $1 per day at 1985 prices (in real terms). Once again, it must be stressed that, shockingly enough, these are USA prices. Here's a YouTube video that discusses these issues and in particular dispels the myths and misconceptions mentioned above. Not the answer you're looking for? Browse other questions tagged economics poverty survival .